Looking for an assisted living facility? Don’t exactly know what they are or what they should offer? When making decisions regarding senior care for your or your loved one, assisted living is an essential topic to explore and consider. We want to help you understand assisted living and find the best community for your needs. Read everything you need to know in our Ultimate Guide to Assisted Living! Yes, assisted living is different than a nursing home. In short, it offers more help to residents than a simple retirement facility, but it’s does not have as many medical resources and intensive care as an nursing home would. Assisted living IS a community usually (but not always) for seniors that provides community life and other help ranging from meal services to medical management to help maintain a healthy and comfortable day-to day-life. It can be challenging for seniors and other with physical or medical conditions to live independently. Assisted living facilities help ensure that residents are living safely, happily and healthily, often as they are transiting into more advanced ages and more dependent medical needs. Now what about these assisted living facilities themselves? It’s all well and good to say assisted living facilities help residents with day-to-day tasks for self care and communal living, but what does that actually mean? Assisted living first of all provides staff and resources for residents that allow them to live semi-independently while still caring for their needs. to provide a vibrant communal life and combat the loneliness that plagues many seniors living (and often reclusive) in their homes. Assisted living facilities can also be covered by Medicaid and other Veteran policies and some health insurance plans. Along with the aforementioned medication management and social activities, there are a lot of services you should expect a good assisted living facility to offer. Daily meal service and nutritional needs. 24/7 on campus staff and security. Basic health and wellness programs. Recreational services and social events. While they don’t provide full medical or intensive care like full bathing of residents (you’ll probably need a nursing home for that level of care), they do offer a lot. What kind of apartments and room commendations can you expect from an assisted living facility? Assisted from the services and accommodations the assisted living facility should be providing all of their residents as a whole, there are other distinguishing factors to consider in assisted living apartments. Just as wheelchair accessible rooms will have wider doorways, assisted living apartments should have characteristics that benefit senior residents. Though assisted living facilities offer more resources than a simple senior apartment rental, the same sentiment still applies. And unlike nursing homes which will often have two residents sharing a room within the facility, assisted living apartments can be more spacious and accommodating to semi-independent living. It is easy to overlook the fact that assisted living facilities are not only for seniors. Though seniors are the main demographic in need to these facilities, there are other types of assisted living facilities as well to cater to the needs of different groups of people. Such facilities aim to assist people of various ages who have physical injuries or a mental health condition that require extra assistance and attentiveness for daily care. If a person is not able to sustain an independent lifestyle with their condition, an assisted living facility for non-seniors may be a good choice for them to make sure they get the proper care and support they need. Disability assisted living facilities simple provide resources and care to those whose specific disability require particular care. These kind of assisted living facilities sometimes offer educational and training opportunities and resources for disabled residents to grow improve their skills. This could mean things like cooking classes, money management training to help them participate in their own self-care and development. Assisted living facilities exist specifically to support U.S. military veterans and their spouses. These facilities care for veterans based on factors such as their age, injury, or other illness. There are both private and state-run assisted living options for veterans and other resources that help sponsor and pay for this kind of care for our veterans. Learn more about these different facilities from the article Types of Assisted Living Facilities. As of 2016, the National average cost of assisted living is $43,000 per year. National average cost ($) of assisted living per year. Costs will fluctuate based on things like locational factors, what resources the facilities offers, and what your Medicaid or health care policy will cover. Discounted pricing or other payment options may be available in different states and facilities specifically to benefits military veterans and their spouses. It is important to note that since assisted living facilities are usually NOT licensed medical facilities (like a nursing home would be), they are usually NOT covered in your average health insurance plan. Check your policy or your Medicaid eligibility to see what kind of help you can get paying for assisted living care for your loved one. More resources and data to help you navigate assisted living costs are included in our article, The Cost of Assisted Living: What You Need to Know. We’ve touched on this a bit earlier in the Ultimate Guide to Assisted Living, but assisted living and nursing homes are two very different things. With each type of residency comes more medical help and intensive personal care. Each type of senior living facility listed above has a semblance of senior support and community, but they each have a different focus. While nursing homes focus more on healthcare and medical assistance for elders and those with advances illness or physical assistance needs, either relating to physical therapy or end-of-life care, assisted living has less but some medical coverage. We’re mostly talking about two things: nutrition and medication management. Assisted living facilities are for people who can still take care of themselves for the most part. They might need (or just enjoy having) some assistance with cooking, daily household tasks like cleaning and laundry, and personal care like showering – but it’s like ordering from a menu… you choose what you want help with. Nursing homes offer a higher level of daily care, including everything from help getting dressed to using the restroom to getting in and out of bed. You might choose to live in a nursing home if you need frequent or daily medical care, or if your ability to get around has lessened and you feel more secure having people check in on you frequently. Now you know more about what assisted living facilities are and what they offer, but now how do you find the right assisted living facility for you. Besides factoring in practical things like location, budget, and services offered, there are other resources available online and around the country to help you locate the best assisted living facility for your or your loved one. We want to help you find the best possible assisted living facility to meet your needs and give you or your loved one the community and care they deserve. You can find a more extensive checklist as well as other websites to physically locating the assisted living facilities across the country here: How to Find an Assisted Living Facility. Contact Green Valley Commons for more information about assisted living facilities in Northern Virginia. What are the requirements for being allowed to live in an assisted living facility? Do you have to be able to bathe yourself and feed yourself? We’ve detailed everything surrounding what assisted living facilities include, but what about the residents? How do you qualify to live in an assisted living facility vs the other types of senior living options? While there are different laws and regulations by state regarding facility and resident requirements, there is a generally rule of thumb most assisted living residents must follow. When doing your research on which facility is best for your or your loved one, contact a local assisted living facility to ask about their requirements. If you have more questions about assisted living requirements, contact Green Valley Commons. Senior Living is a more general term that refers to the wide variety of facilities and care resources for seniors to provide them healthy and happy living arrangements for their stage in life. The term senior living does not just refer to tradition retirement communities or senior independent living apartments. Medication management is one of the distinguishing factors of assisted living facilities. Most seniors require some form of daily medication to combat the plethora of ailments that come hand and hand with aging. That’s just how it goes. Up to 85% of assisted living residents are in need of help with daily medication management services. Medication management is important and must be done properly and legally. It is the legal responsibility of the staff to be trained and accurate when distributing medication to residents. Along with trained staff, it is important for assisted living facilities to either have a licensed pharmacist or doctor either on staff or call to provide easy access to medication refills and renewals. Especially regarding medication management and health care, it is essential for assisted living facilities to follow the letter of the law and provide the best services for the residents in their care. *Specific policies and procedures for assisted living may vary by state. Assisted living facilities can have a licensed pharmacist or doctor on staff. This increases the efficiency of medication management programs to benefit residents with easy access to prescription refills and renewals. If there is no pharmacist or other medical professional on staff, assisted living facilities often partner with pharmacies and third-party medication providers (such as the CVS health company Omnicare for example) to provide the medication services their residents need. “Two-thirds of assisted living providers which offer ancillary services reported using a third-party pharmacy provider, according to a recent online survey from the American Seniors Housing Association (ASHA).” (Read full article here). All medication must be prescribed and administered correctly and by the right people at the right time. 27% of the assisted living facilities have RN (registered nurse) who gives prescriptions, which means they either deliver pre-packaged doses or hand the residents the correct dosage. Likewise, 32% of facilites have RNs give injections for IV medications or prescribed ointments. 55% of the of assisted living facilities rely on a certified medication aides, medication supervisors, or medication technicians to administer medications to residents. 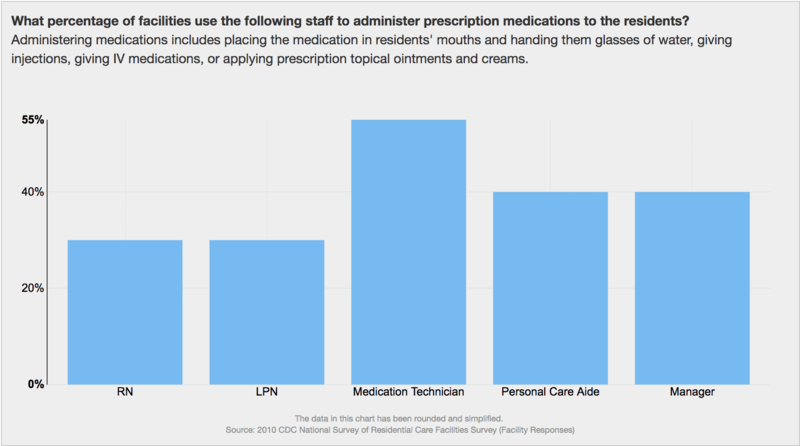 88% have other staff that assists residents with their medications by administering drops, topical ointments, and given reminders to residents who take their own pills to make sure they take their medication on time. ( A 2010 study from the CDC found that 91% of residents in need of medication were able to follow through with taking their medicine with simple oversight and reminders from staff). Assisted living facilites must have a written Medication Management Plan that is usually approved by an entity such as the Board of Nursing or Board of Pharmacy in conjunction with the directors of the assisted living facility. Click here to read the specify legal points outlined by the Code of Virginia pertain to the regulations for assisted living, including the required policies for a Medication Management Plan. Besides medication management, one of the key components of any assisted living facility is the community. Not only does communal life provide stimulating social interactions that help decrease loneliness and increase happiness, these communities often have a lot more to offer. it’s about creating a safe a friendly environment for residents to live comfortably and semi-independently. This includes providing in house amenities, services, events, and more to offer engaging social, physical, and intellectual activities. The activities offered by assisted living communities are often a big consideration when choosing what facility is best for you or your loved one. Within the facility itself, maybe there is a pool or nice outdoor grounds to offer physical activity and fun. Holiday parties and other events are great ways to both foster community and create enjoyable activity at the same time. Off-campus field trips, speciality clubs, classes, crafts, and movie nights are all examples of the types of activities for seniors that an assisted living facility may offer. Still need help choosing an assisted living facility? We know, it’s a lot of information to digest. Besides knowing what things to look for when it comes to medication management, facility accommodations, and community life, don’t forget to look get third party advice and reviews to help inform your decision. When you’re looking for an assisted living facility, we recommend visiting the facility first hand and asking questions to see with your own eyes all that they offer. Look for online reviews, talk to staff members, and get feedback from residents about their experience at that facility. Have more questions about assisted living? Contact us at Green Valley Commons. We are an assisted living facility in Winchester, Virginia are are happy to help answer questions and find the right senior living community for you or your loved one.